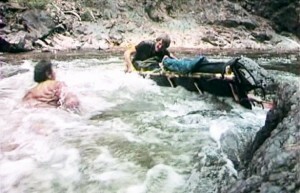 The success of John Boorman’s Deliverance (1972), which dramatised the clash between the white collar urbanity of middle class America and a disenfranchised backwoods rural community created ripples of influence that extended far and wide. Although ostensibly an action orientated adventure movie, there was enough paranoia and nightmarish hysteria in the film to reignite the inspiration of low budget filmmakers working within the horror genre. The rural slasher film subsequently became a sub-genre within a sub-genre, and much of its success was derived from the necessity for location shooting. Another happy by product of the poverty row production values enforced upon such films as The Last House on the Left (1972), The Texas Chainsaw Massacre (1974) and Just Before Dawn (1980) was the need to shoot with handheld cameras. This gave these rural horror pictures a sense of verisimilitude that the more slickly produced effects driven slasher pictures lacked. They also tap into a more primal impulse; the survival of the fittest in the face of both nature and an unseen assailant. 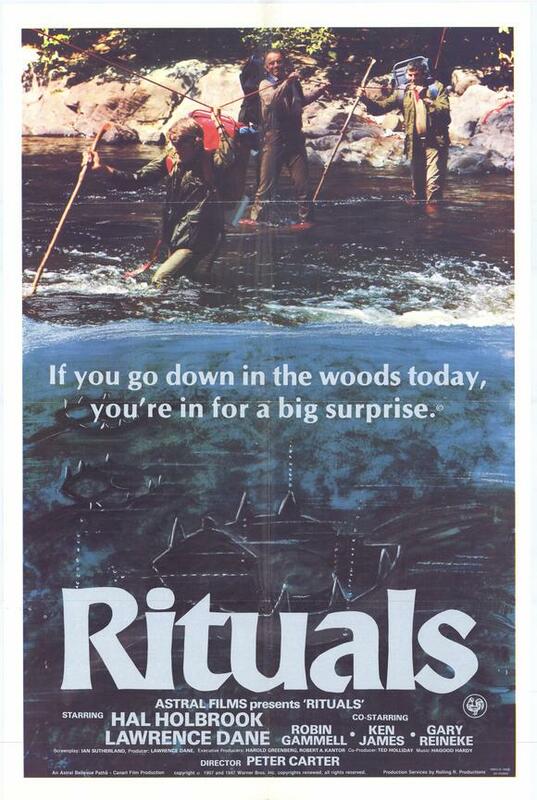 For me these backwoods chillers represent the most intriguing face of the slasher film, and there are very few that impress as much as Rituals. 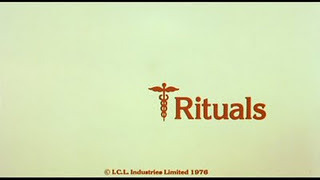 Rituals is truly one of the big losers of modern film history. But the advent of niche DVD distributors have enabled films such as this to have a moment in the sunlight that they have yet to experience. It didn’t help that the film was left gathering dust for well over twelve months before it was finally released, and when it was finally put out theatrically by Aquarius Releasing it promptly sank without trace. 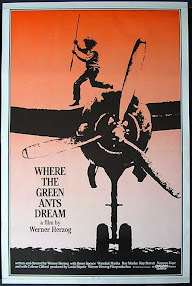 This is something of a surprise when one discovers that Harry H. Novak was co-producer of the picture (along with Lawrence Dane who plays Mitzi in the film) for Novak was a man who knew how to sell a picture and get it in the grind houses and drive ins. Whatever the reason for the films failure, the result was a minor cult following. What makes Rituals so interesting is the excellent ensemble cast, the wonderfully creepy setting (Batachawana Bay in Ontario, Canada), the decision to shoot in continuity (the result of which is a palpable sense of exhaustion and mistrust) and a villain with a truly far out motive. The film opens with five friends embarking on their yearly ritual of a vacation, but it becomes apparent instantly that there are tensions within this group. All of them work in the medical profession, and several are haunted by decisions they have made in the past on the operating table. The group is already fragmenting before they have set up camp due to a series of opposing ethical beliefs. The last thing these highly strung and edgy individuals need is the disappearance of their boots. This is a moment of genius from scriptwriter Ian Sutherland; the only one he chooses to leave with boots is the organiser of this particular expedition. A character with macho pretensions, the one we are led to believe is best equipped to deal with the savage wilderness of the Canadian outback. Sutherland writes him out within the first twenty minutes, installs him as a potential red herring, and then concentrates on the vulnerabilities of the remaining four. The second sign that something is amiss is a decapitated deer’s head outside the camp, the third terrible event the death of one of the party after the group unwittingly disturb a wasps nest. The fourth travail sees the three survivors lured into a nearby river, the floor of which is covered with bear traps. But despite these external threats the film is propelled by the rage, guilt and anger within the three men. Harry (Hal Holbrook) is a veteran of the Korean war, a brain specialist who must live with the thought of the vegetative state some of his patients have been reduced too, and must contend with guilt over the death of his father. Mitzi (Lawrence Dane) is a whiner, a truly selfish individual who constantly niggles at Harry’s insecurities despite being totally reliant on Harry’s survival skills. The third man Martin (Robin Gemmell) is a homosexual alcoholic whose fate is in the hands of Harry and Mitzi after breaking his leg in the bear trap. For much of the film it is the simmering rage within Harry and Mitzi that propels them towards the dam that they believe represents salvation. They are left clues to the assailant’s motives, but Harry is determined that he won’t be degraded. The final twenty minutes shifts tenor and becomes a walking nightmare. The lone silhouette of their tormentor stands like a sentinel in the distance, watching their struggles as they carry the now deceased Martin on a stretcher. These are some of the most eerie moments in the film. The post-apocalyptic landscape surrounding the disused dam only adding to the alienation and terror. But Rituals still has some vicious surprises around the corner. The demise of Mitzi is truly horrifying as is the deformed and pathetic sight of the WW2 veteran that has been causing the mayhem. A man who had any sense of normality snatched from him by the botched operations of the past. He is the walking embodiment of the groups repressed guilt, the realisation of an ethical nightmare. It has be said Rituals is very poor technically, but British director Peter Carter keeps the narrative moving at pace. There are few stand out images in the movie, but Carter ends it with a brilliant one as a weary and morally shattered Harry sits in the middle of a deserted road unable to move forward. This is one of your best write ups, Shaun, and I am ecstatic you finally got to see it and enjoyed it so much. Code Red kind of fumbled the ball on getting the movie out there and according to the Olsen's, there are plenty of copies that remain available despite this being one of the most sought after and eagerly awaited titles on cult DVD. I particularly liked how the deaths of the doctors is foreshadowed early on when they're dancing around the fire mocking a deformed man. I didn't pay much attention to it till watching it the second time. The extras packed DVD is well worth owning and it's a shame the film is snubbed yet again. Oh well. Your review of RITUALS became lodged somewhere deep in my mind Brian. In facts yours is the only review of the film I've read. Unfortunately I wasn't able to obtain the Code Red DVD, but the film is available on Youtube. The less said about the quality of the print the better. There comes a point where simply watching these type of films is enough. I've been spoilt rotten by blu-ray this year! I thought it was an excellent film, its raw primal power came through even in a print that is barely watchable. Hal Holbrook is awesome as the guilt riddled Korean war veteran. 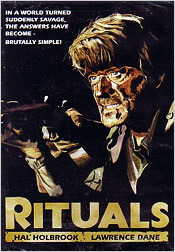 I'd like to own a legitimate cleaned up DVD of RITUALS, but it's not going to happen for a while I think. The Code Red DVD is the best the film has ever looked and even that isn't particularly spectacular. Particularly of note is the conclusion in the cabin. An accident in the lab caused the finale to be far too dark and CR's disc really makes it "shine". I couldn't imagine watching a movie on youtube to get a good feel for it, so that speaks volumes about the power of the film that you were able to enjoy it in that way. I have a nice handful of (mostly unwatched) blu discs, but the format hasn't grabbed me just yet. Most of mine are for older, more obscure titles, anyways, and I've bought them on impulse mainly because some of these exploitation pictures are getting this kind of treatment, lol. Yeah the cabin sequence is particularly problematic, but poor transfer or not, seeing Lawrence Danes burnt alive, and hearing his pitiful wailing, has a power and resonance that is deeply affecting. The screen on my laptop is about 18", and with my headphones on in a darkened room, it isn't too bad a substitute. The simple fact is some of these titles you can purchase readily in the US, are simply not available in the UK. And if they are, they have to be imported, and it soon becomes expensive. The important thing is being able to watch the film, an excellent pristine transfer is an added bonus. I bought two blu-ray's the other day - MIDNIGHT EXPRESS (which I've watched) and THE FRENCH CONNECTION, which I've yet to check out. I also have the recent release of QUATERMASS AND THE PIT on its way. I'm particularly looking forward to that one. Woah, I'd totally forgotten this film even existed. I had it on VHS back in the day, but remember large portions of the film were so dark that you couldn't see what was going on. Your review makes me think maybe I should revisit it. Anyway, you mention Deliverance, but have you seen Southern Comfort? It is also in the same sub-genre, and many often call it a rip-off (of Deliverance, that is) but even if it is, I still think it's a far superior feature. I have it on good authority that the DVD released by Code Red earlier this year is a signifcant improvement over other releases. The only problem is it sold out in no time, and is now difficult to get hold of. Yes, I've seen SOUTHERN COMFORT, and I think it's a great film. In fact I prefer it to DELIVERANCE as well. great review, once again Shaun. Dare I say it, your latest "remix" of this one is even better? Commendable stuff.